I received an email from a friend of mine, Scott, in California telling me that today, June 19th, is National Martini Day. He wanted to know, given that fact, if we planned to have a Martini Thursday in addition to our traditional Martini Friday that we enjoy every other week of the year. 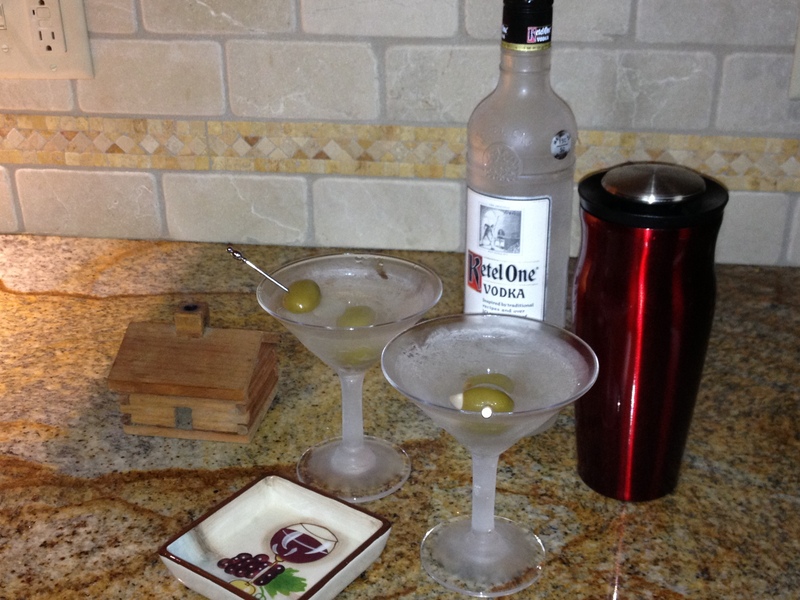 Now as you may know my husband and I have been sharing a Martini nearly every Friday afternoon for more than ten years. How is it that I was unaware that there was a specific date set aside each year to honor this classic cocktail? I guess the fact that there would be a specific National Martini Day doesn’t surprise me as much as my ignorance of when that occurs each year. Still it does make me consider making an exception this week and shaking up a couple of the ice cold cocktails two days in a row. I went through the first 40 or so years of my life without tasting a Martini. I mean a real martini, not one of those impostors that include martini in their name when the only thing they have in common with the traditional cocktail is the glass in which they are served. Oh they might have gin or vodka in them but it is often disguised by the addition of fruit juices or liqueurs to make them more palatable to folks who don’t enjoy the taste of the alcohol but are looking for a sweet drink in a fancy glass that will give them a pleasant little buzz. They have cute names like Appletini, Lemon Drop, Chocolate martini, and even Flirtini, which is the most popular drink at our neighborhood bar and grill. The Martinis that my husband and I share are the real deal made with gin or vodka, dry with just a splash of vermouth to coat the ice, shaken not stirred, in the way of James Bond and poured into icy martini glasses that we keep in the freezer. We keep the vodka/gin in the freezer as well to insure our drinks are as cold as possible without being watered down by the ice in the shaker. The vermouth is kept in the refrigerator as it would become frozen solid if kept in the freezer. I would say that the biggest impediment to a great Martini away from home is finding a bartender that has the forethought (or the space) to keep his glasses, let alone some liquor, iced up. The garnish on the pick in a traditional martini is generally one or more olives pitted and unstuffed or with just a piece of pimento inside. At home we have a standard pick that includes a garlic stuffed giant olive, a Tipsy Onion (a vermouth soaked cocktail onion), finishing with a large pimento stuffed olive on the bottom. While some would argue that this combination somehow bastardizes a true Martini but I think those folks just wish they had thought of it themselves. However you like your Martinis made, remember that they are to be sipped and savored while enjoying the company you keep. When properly made, one great Martini is enough to make an ordinary afternoon a pleasant memory. Cheers! This entry was tagged gin, National Martini Day, olives, shaken not stirred, tipsy onions, traditional cocktails, vodka. Bookmark the permalink.